This system is quite complex, I will do my best to make it simple to understand and, for those who have the courage, I tried to put as much details on the photos. The program is not necessarily the most optimized, free to modify it. If you want details on how the system works, you will find them in the program comments. The second part of the system is exclusively mechanical. 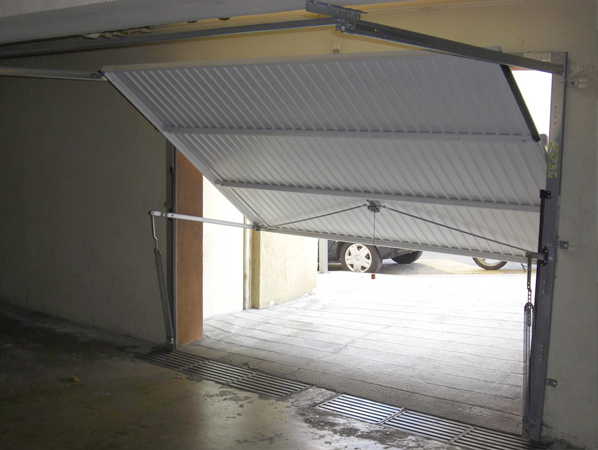 I have a swinging garage door like this one. So I was inspired by the existing locking system that I decided to "modify". In the base system, there are two axes hanging on the door that slide behind the door frame, left and right to prevent it from tipping. So I imagined an electrically controllable system, with stepper motors, that can take in or out steel stem in soil. This is where the interest of using a bistable relay comes into play. A bistable relay, unlike a conventional relay, retains that switching position even if it is no longer powered. If the current is turned off, then nothing works, but if the current returns, then the Arduino "Reset" and if there was not a bistable relay then the communication between the sensor and the Arduino would be restored, and there, the Nasty thieves can go home if they reprogrammed the sensor and closed the box! As you can imagine, the Arduino is the brain of this lock system. The program is available in this tutorial. It is very interesting to use an Arduino Micro because it is not bulky and adapts perfectly to the project. I mean that all pins "Digital" (14) and "Analog" (6) are used. In the circuit diagram, you can see a thermostat. This is used to control the temperature in the housing but especially the voltage regulators. If their temperature exceeds 50 ° C, then the power supply to these controllers is switched off via a relay, and an orange LED lights up to prevent the problem. Once power is turned off, the controllers can cool down and after the temperature has dropped back to 40 ° C, power is restored. An overheating may be due to a "too long" power supply of the motors, if they do not go to standby for example ... (High current consumed = heating of the regulators) For safety, if the thermostat did not work, put a thermal fuse in series ... We're never too careful. You will also need small screw terminals, 2.54 pitch female connectors (not to have the Arduino to be soldered), insulated cross-section 0.5 single strand wire, multi-strand wire with a suitable motor section (which supports Of the 12V 2A), a "Vero Board", a small contactor (see box of the cavity sensor), two pushbuttons for the opening and closing controls, and a small number of "limit switch"
I needed a tailor-made enclosure for the sensor to be in the best possible conditions. I measured with a callipers all the dimensions I needed to draw the case, then I drew what I wanted on a 3D design software (Solidworks). A plexo box was not enough, because it needed like a kind of high wind to prevent the rain from touching the sensor and to seep into the box. Moreover, for aesthetic reasons, I wanted the "BPV" to be activated at the same time as we put the finger on the sensor (I did not want a button next to the sensor), so it was necessary that it is guided in vertical translation to press a small contactor located under the circuit of the sensor (see photos). It is also necessary to think of the humidity and the insects (because the insects and the electronics, it does not make good housekeeping!) For the moisture, I left enough space on each side of the box to be able to slip there, On one side an anti-tear "limit switch" and on the other a small sachet of silica gel which is a very good moisture absorber. In the case of insects, the entire interior part containing the electronics is insulated from the outside by small partitions which surround the surface of the sensor which faces outwards. (See photos // digital model). Once drawn, it is enough to print the case with a 3D printer (density = 30% for me). If you do not have one, you may be able to go to a FabLab or something. There will be a little less text in this step, the pictures speak for themselves. Some explanations on the choice of components. Explanations ... If the evil thieves want to cut the axes (which is already very difficult in normal times), well, by applying their cutting tools on the axis (saw, diskette or other) Axis which turns on itself thanks to the bearing. As a result, the spindle will never be damaged by the disk drive! It must of course 2 times this list of hardware to make the 2 lock blocks. We started by fixing all the tubes and the main box on the wall. Before passing the cables through the frame of the door it is necessary to drill the holes that will accommodate the axes. This is done with a conical drill bit. Then a piece of copper pipe is inserted to solidify the door sheet. Once the stem moves freely inside the copper tube, trace and drill the hole in the ground, then ad a piece of plastic tube (not metal because of oxidation due to rain on the ground!) and add concrete to hold it in place. Check the connections and activate the current carefully! I hope you liked this project, if you have any question, don't be shy and let me a comment! Really solid, fail-proof logical construction - very cool. Impressive comme diraient nos amis anglophones. You manage every aspect of this system. The only point is you didn't add link for parts. I will look for fingerprint detector by myself... boring. This is awesome! I wish I had something like this at my house.